February 2019 Yoga Classes in Nederland & Beaumont Texas for Gail Pickens-Barger. Over 18 years teaching experience. Mondays 6:15 PM – Beginners Yoga. Come a bit early if it is your first time, to register. $10. Bring a yoga mat (I do have extras). Questions? Give me a call 409-727-3177, I will return your call! Truth! Amazing Massive Benefits Of Yoga And More (71 more)! Over the past several years, yoga has experienced an upsurge in popularity in the western world among medical professionals and celebrities alike. While many associate yoga with new age mysticism or the latest fad at the gym, yoga is actually an ancient practice that connects the mind, body, and spirit through body poses, controlled breathing, and meditation. The practice of yoga has many health benefits associated with it, so read below to discover 77 benefits of incorporating yoga in to your or your patient’s fitness program. Aging. Yoga stimulates the detoxification process within the body. Detoxification has been shown to delay aging, among many other health benefits. Integrated function of the body. Yoga is derived from Sanskrit and means “to join together and direct one’s attention.” This is exactly what happens to your body after you start practicing yoga. Yogis find that their body works together much better, resulting in more graceful and efficient body movements. Triglycerides. Triglycerides are the chemical form of fat in the blood, and elevated levels can indicate a risk for heart disease and high blood pressure. A recent study shows that yoga can lead to “significantly lower” levels of triglycerides. Read more about the results of that study here. Multiple sclerosis. According to this article, “yoga is now recognized as an excellent means of MS management.” Additionally, National Center for Complementary and Alternative Medicine is funding a clinical trial of yoga for treating multiple sclerosis. Benefits of a regular beginners yoga practice in Nederland, Texas. Benefits of a regular Beginners Yoga Practice. Lose Weight, Eliminate Stress, Increase Flexibility, Build Strength, Better Balance and MORE! Just a few benefits of a regular yoga practice. Mondays – Beginners Yoga at 6:15 PM. $10. At Wesley UMC, 3515 Helena Avenue, Nederland, Texas. Held in the foyer of the sanctuary building. The sanctuary building is the closest building to the street. Come a bit early to register, get your yoga props (but you bring a yoga mat), find your spot, turn the phone to vibrate, or better yet off and get your yoga in for the week! International Yoga Teacher, with over 18 years teaching experience, Gail Pickens-Barger. Call for further inquiries. 409-727-3177. Avenue, Nederland, Texas at Wesley UMC. It is the most northern building on the church property. the shirt will ride up the back side and sometimes tummy part of your body. I wear a tank top under my t-shirt, so if this happens, I know that I am not showing any skin. Come a bit early to register, get your yoga props (a strap,a block, sometimes a blanket) and your spot. Please put phones on silent. p.s. 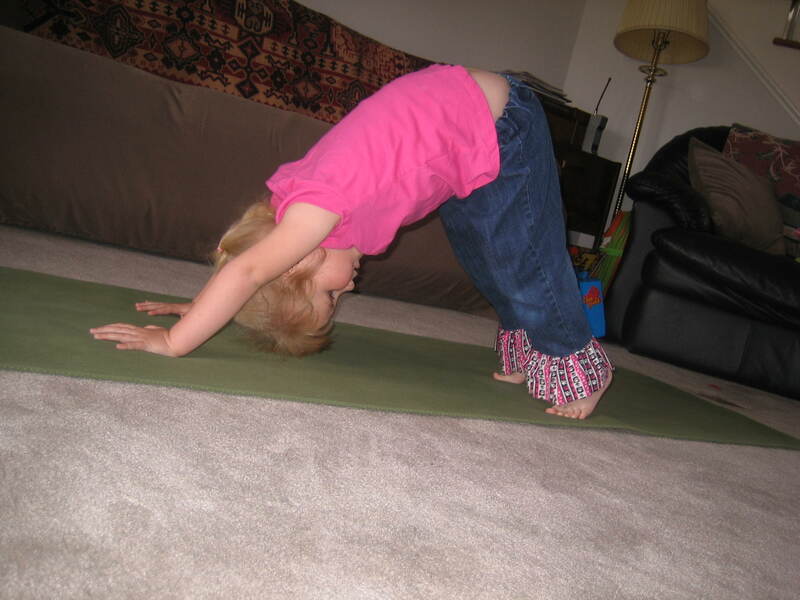 Here’s a pic of my daughter doing Downward Facing Dog. Notice her shirt riding up? Shirt riding up in Downward Facing Dog.